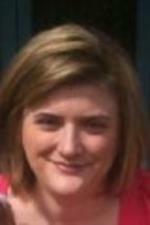 Summer is upon us in Fort Wayne, and with it comes the sticky, drippy heat of the season. Not that I&apos;m complaining after the winter we just had! If you&apos;re lucky enough to have a pool of your own to jump into, great! 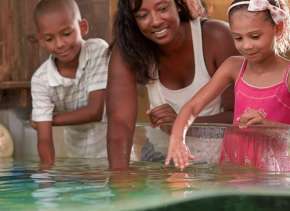 But if you&apos;re like most of us, and you&apos;re looking for some place to take the family for an afternoon of splish-splashing fun, take heart. Grab your beach towels, goggles, coolers and kids (don&apos;t forget the sunscreen!) 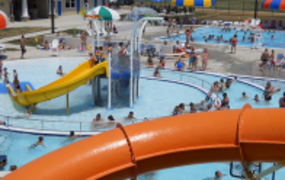 and head out to one of Fort Wayne&apos;s public pools. Northside Pool Northside Pool is located behind Northside High School at 705 E. State Blvd. and Parnell Ave. This is where my family usually goes. We started going there years ago when my kids took their first swimming lessons there. 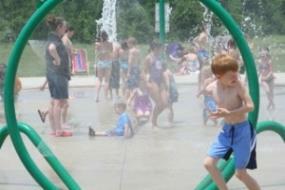 The pool is located inside Bob Arnold Northside Park, across from the playground. There&apos;s a pool on one side with fountains and water toys for kids under seven, two really cool water slides and a spacious pool for bigger kids and adults. 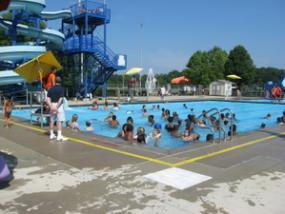 Northside Pool is open daily: 12:30p.m. - 5:00 p.m. Mondays, Wednesdays and Fridays: 7:00 p.m. - 9:00 pm Adult Swims and water aerobics: Tuesdays and Thursdays 7:00 p.m. - 8:00 p.m. 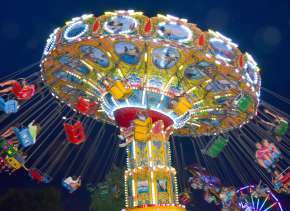 Admission Ages 2 and under: Free Ages 2-17: $3.50 Afternoon;$1.50 Evening Ages 17 and over: $4.50 Afternoon; $2.00 Evening Insider &apos;s Tip: Northside has plenty of umbrellas, but does not offer lounge chairs. If you don&apos;t want to lie on your towel, bring your own chair. 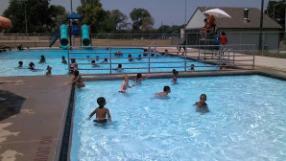 McMillen Pool McMillen Pool is on the city&apos;s southeast side at 3900 Hessen Cassel and Oxford. It&apos;s located inside McMillen Park, where you can also find a playground, driving range and really nice golf course. This pool is known for its water slides and bonus for swimming early in the season: heated water! The pool is open daily: 1:30 p.m. - 7:00 p.m. Admission Ages 2 and under: Free Ages 2-17: $2.25 Ages 17 and over: $2.75 Insider&apos;s Tip: Kids ages 8 - 18 can take swimming lessons FOR FREE at McMillen Pool from June 11 through July 25 as a part of the Lifetime Sports Academy. Memorial Pool Memorial Pool is located east of downtown on Washington Blvd and Maumee Ave., with access off of Glasgow. It&apos;s a part of Memorial Park, which is dedicated to the men and women of Fort Wayne who lost their lives in World War I. In addition to baseball diamonds and basketball courts, the park has many beautiful monuments and sculptures. 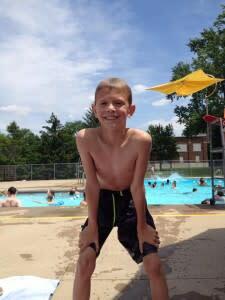 The pool is open daily: 12:30 p.m. - 5:00 p.m. Adult Swims: Saturdays and Sundays 11:30 a.m. - 12:30 p.m. 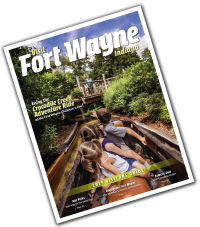 Admission Ages 2 and under: Free Ages 2-17: $2.25 Ages 17 and over: $2.25 Insider&apos;s Tip: After your swim, take the kids through the park to see the monument to Fort Wayne resident Art Smith. Mr. Smith, an aviation pioneer, was the originator of skywriting, and Smith Field Airport is named in his honor. 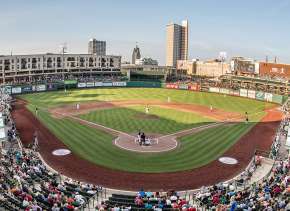 Robert E. Meyers Park (When Parkview Field doesn’t have a scheduled event.) - Inside North Gate of Parkview Field on Jefferson Blvd. Shoaff Park - 6401 St. Joe Rd. Insider&apos;s Tip: Two additional splash pads to try are Headwaters Park downtown and Lutheran Park and Gardens just south of downtown on Fairfield Avenue. Bonus Pool! Though not technically in Fort Wayne, I have to give a shout out to Jury Pool in New Haven. This pool is operated by the city of New Haven Parks & Recreation and is definitely worth the fifteen-minute drive if you&apos;re out that way. As you can see, there are plenty of places for cooling off and some good old-fashioned water shenanigans in the Fort. Pick your location and have a blast!